A well-known figure in the games industry, Hunicke will help lead the new interdisciplinary undergraduate program in Games and Playable Media with arts and engineering at UC Santa Cruz. 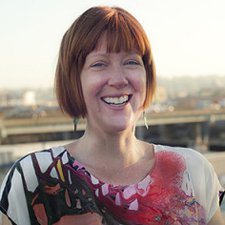 Hunicke is the co-founder and CEO of San Francisco’s independent game studio, Funomena, and has a background in fine art, computer science and applied game studies. She was named one of Forbes’s “Top 12 Women in Gaming to Watch” in 2013. Hunicke was recruited to join Electronic Arts in 2005, where she worked on The Sims2, MySims, and Steven Spielberg’s Boom Blox series for the Wii. In 2009, she joined the independent game studio, thatgamecompany, as executive producer for the award-winning Playstation Network title Journey. "I have admired Robin's work for many years, so having her join the faculty is a dream come true,” said Jim Whitehead, UC Santa Cruz Professor of Computational Media. “Her blend of deep design and technical background is extremely rare, and I'm excited she will be bringing this knowledge to our students." Hunicke co-organizes the Experimental Gameplay Workshop at the Game Developers Conference, the largest annual gathering of professional video game developers. She has chaired the IndieCade Festival of Indpendent Games, and has published and lectured extensively on the “Mechanics, Dynamics, Aesthetics” model of game design. An evangelist for diversity of thought and participation in game design and game culture, Hunicke was honored last year for her role as an ambassador for women at Microsoft’s annual Women in Gaming Awards. “We're thrilled to have someone join us whose values are in such alignment with Games and Playable Media at UC Santa Cruz," he added.